Blanketing the Earth is a thick layer of air that protects us from radiation from the Sun, falling meteors and toxic gases. This blanket, known as the atmosphere, has three layers. Without it, our Earth would be like any other planet – extremely hot or cold, pockmarked and lifeless. Three cheers for the atmosphere! There are five layers within the atmosphere. 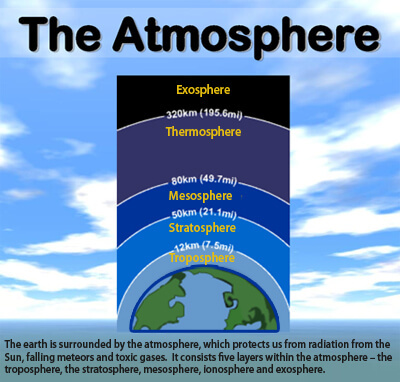 The troposphere, the stratosphere, mesosphere, ionosphere and exosphere are the layers of the atmosphere. The troposphere lies closest to the Earth and is about 11 miles thick. This layer contains most of the air and oxygen in the atmosphere. Our weather is formed in the troposphere. Water evaporates from land to become rain or snow. Winds bring warm or cool weather. The stratosphere lies above the troposphere and goes up about 30 miles high. The ozone layer is in the stratosphere. The ozone protects us from harmful rays from the Sun. The mesosphere is the next layer, reaching 50 miles from the Earth. This layer of the atmosphere is very cold – about -180 degrees Fahrenheit. Brrrr! Here is where most meteors burn up. Without this layer, our Earth would be pocked like the Moon and other planets. 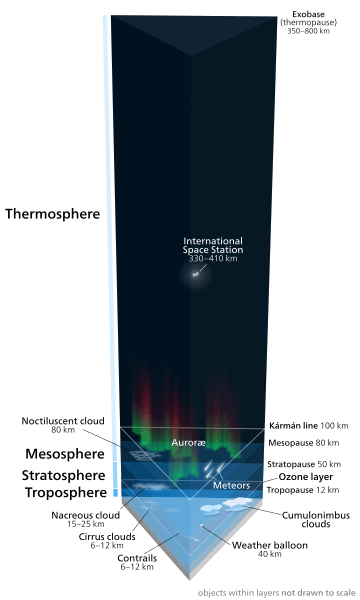 The ionosphere extends 430 miles above the Earth and is considered outer space. It is very thin and very cold. An electrical layer created by ions is found here which is used to transmit radio waves. This electrical layer also causes the Northern Lights. High above the Earth is the exosphere, the final layer of our atmosphere. This layer extends into space. Solar winds compress it and push it down. When the winds are still, this layer can extend more than 6,000 miles into space. Question: Can the atmosphere be damaged? Answer: Chemicals and pollution can damage the atmosphere. Enjoyed the Easy Earth Science for Kids all about the Atmosphere info? Take the FREE & Fun all about the Atmosphere quiz and download FREE all about the Atmosphere worksheet for kids. For lengthy info click here. Declan, Tobin. " Earth's Atmosphere facts for Kids ." Easy Science for Kids, Apr 2019. Web. 21 Apr 2019. < https://easyscienceforkids.com/all-about-the-atmosphere/ >.